Though the writer has passed the sixtieth milestone of life and completed a quarter of a century’s hard but happy work on this magazine—yet he feels that “GO FORWARD!” [Exodus 14:15] is the Lord’s pressing word unto him at this time. If he should have acquired any laurels, he certainly does not wish to rest upon them; nor does he—while health and strength are granted—intend to moderate his own studies or relax in his efforts. It has long been his desire to WEAR out—rather than RUST out; or, to express it in Scripture language, to “very gladly spend and be spent” [2 Corinthians 12:15] in endeavoring to serve the Lord and minister to His beloved people. Nor could he warrantably look for any measure of realizing that desire, if he slackened; rather should he seek to “Go forward” with increased earnestness and diligence, “redeeming the time, because the days are evil” [Ephesians 5:16]. The more evil the days—the grander the opportunity for proving the sufficiency of God’s grace, and the greater the privilege in serving His children. 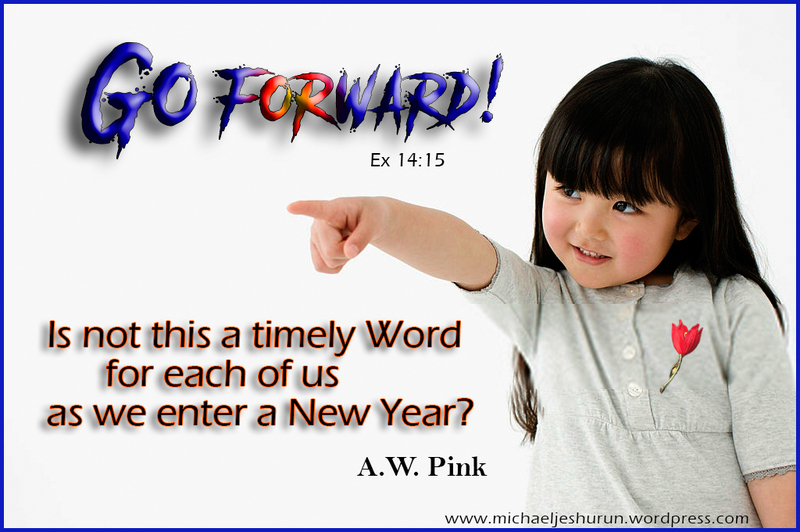 “GO FORWARD!” Is not this a TIMELY WORD for each of us as we enter a new year? Is not this a suitable motto for us to keep in mind as we journey through [if God permits] 1947? We need to clearly realize there is no such thing as remaining STATIONARY in the spiritual life: if we do not progress—we inevitably retrograde. How that solemn fact should search our hearts! Christian friend, your history this year will be either one of going forward—or backsliding. This New Year will mark either an increased fruitfulness in your soul and life—to the glory of Him whose name you bear; or increased leanness and barrenness—to His reproach! It will witness either a growing in grace—or a decline in your spirituality. It will record either an increased love for the Word, use of the Throne of Grace, strictness of walk and closer communion with Christ—or a growing coldness and a following of Him afar off. O Christian reader, before reading any further, will you not now close your eyes and lift up your heart in earnest prayer for yourself and for all your brethren and sisters in Christ? “GO FORWARD!” The HISTORIC OCCASION on which those words were uttered is noteworthy, and a brief consideration of the same the better enables us to make application of them unto ourselves. The situation confronting Israel was a hopeless one, so far as they were concerned; and had not the Lord intervened, they had undoubtedly perished. After their exodus from Egypt, Pharaoh at the head of a great military force pursued and overtook them. With impassable obstacles on either side, the Red Sea in front, and the enemy in the rear—that company of ex-slaves with their wives and children were in a truly desperate plight, and death was all they expected [Exodus 14:10, 12]. Then it was that Moses said, “Do not be afraid. Stand still—and you will see the deliverance the LORD will bring you today. The Egyptians you see today—you will never see again. The LORD will fight for you; you need only to be still.” [Exodus 14:13-14]. Those words, “stand still—and you will see the deliverance of the Lord,” have been grossly carnalized and grievously wrested by those who foster a FATALISTIC INERTIA. “Stand still” obviously has the force here of “be not dismayed, do not panic, keep calm,” as the “you need only to be still” shows. Then followed, “and you will see the deliverance of the Lord,” which signified, Lift up your hearts and eyes in the exercise of faith. But faith must have a foundation to rest upon, even the Word of Him who cannot lie; and hence, the sure promise was given, “which the LORD will bring you today…The Lord shall fight for you.” Previously, they had “lifted up their eyes” and beheld Egyptians [Exodus 14:10]; and in consequence, were sore afraid. But there was something else and some One else for faith to “see”—namely, the promised salvation or deliverance of Jehovah, which was not yet visible to outward sight! If their faith were steadfastly occupied with that, their trembling hearts would be stilled, and strength obtained for the performance of duty or the discharge of their responsibility. Then came the Divine order to Moses, “Speak unto the children of Israel, that they GO FORWARD” [Exodus 14:15]. That was a challenge to faith. To carnal reason, compliance appeared suicidal. To “Go forward” meant walking into the Red Sea—which, at that time, presented an unbroken mass of water. Ah—but they had been promised Divine deliverance. Yes—but God required them to lay hold of that promise and act on it. And they did: “By faith they passed through the Red sea as by dry land” [Hebrews 11:29]. If “by faith,” then certainly not “by sight”—the two things being opposed the one to the other [2 Corinthians 5:7]. Not until they stepped out with confidence in God’s Word—did He appear for them and begin to open the waters; and as they continued onward—He continued to open a way for them. It is in response to the actings of faith, that God works, for He never sets a premium on unbelief. Here—then, is the first signification of this word for us: “Go forward” with your heart resting on the sure promises of God—and with the eyes of faith steadfastly fixed upon Him. “Go forward!” Second, this was a call to obedience—namely, the obedience of “faith” [Romans 1:5]. There was a COMMAND annexed to the promise—to prove them and show whether or not they had received the promise sincerely. There are certain grand benefits which God gives to His people without imposing any condition—such as the providing of a Redeemer who took our nature, fulfilled the Law, satisfied God’s provoked justice on our behalf, and merited grace sufficient for our salvation. But having laid this glorious foundation, God treats with us as MORAL AGENTS, propounds to us a covenant which requires our cordial consent or agreement. Repentance and faith are required of us—in order to the forgiveness of our sins. All through the Christian life, our concurrence is necessary. God requires from us FAITH in each of His promises—and OBEDIENCE to the commands annexed to them. Obedience is the path He has appointed, and in which His blessing is to be found. We must follow the course He has prescribed, if we would have Him show Himself strong on our behalf. If we honor His precepts, He will honor us. “Go forward,” then, in complete subjection to His revealed will, and walking according to His Word. “Go forward!” Third, this was a command to advance. It was so to Israel; it is so unto us. Onward Christian soldiers! Steadfastly persevere along the path of duty, walking in that narrow way which the Divine precepts have marked out for us. No matter what is your condition and circumstances, what obstacles may confront you, what RED SEA OF DIFFICULTY OR DANGER is before you, “Go forward” is your marching orders. Raise no objections. “The slothful man says: There is a lion outside, I shall be slain in the streets!” [Proverbs 22:13], let no such idle excuse issue from your lips. Rather say, “I can do all things through Christ who strengthens me” [Philippians 4:13]. When your heart fails, when your soul is well-near overwhelmed by the problem or task facing you, do not panic, but lift up the EYES OF FAITH unto the Lord, realize He it is who bids you advance. Go forward depending on His promise—and you will not be confounded. Christ’s oft-repeated “follow me” is but another form of “Go forward.” So too is every exhortation for us to “grow in grace, and in the knowledge of our Lord” [2 Peter 3:18]. We are ever in need of such a word of exhortation, for we are prone to relax and take things easy—the more so as old age creeps upon us. Rest not satisfied with your present knowledge and apprehension of the Truth—but seek for a deeper and fuller one. Be not content with your present spiritual attainments, for “there remains yet very much land to be possessed!” [Joshua 13:1]. The manna you gathered yesterday—will not suffice for today. “Be not weary in well doing” [2 Thessalonians 3:13]. “No man, having put his hand to the plough, and looking back—is fit for the kingdom of God” [Luke 9:62]. Let the prayerful resolve of each of us be: “Forgetting those things which are behind, and reaching forth unto those things which are before, I press toward the mark for the prize of the high calling of God in Christ Jesus!” [Philippians 3:13-14]. Beg God to write this word in your heart! A most excellent reminder for God’s people: Pink never fails to encourage. May our Lord bless His people this new year with hearts that desire more of Him and of the things of God. May we press on and stay the course, all by His power.